The global cinema industry is going through its fastest pace of change since the introduction of digital projectors. Customers have more ways to consume content, in more formats and from more sources, than ever before. 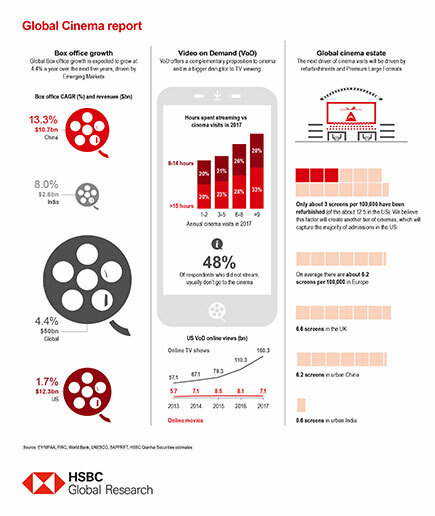 But while many think Video-on-Demand will hit cinema attendances, we think they benefit from it. But like televisions, VCRs and DVDs, Video-on-Demand – VoD – will require cinemas to refresh their proposition. Cinema admissions in the US have been fallen by an average of 1.6 per cent a year since 2000. But while VoD is having some impact in developed markets, we believe the majority of this decline is due underinvestment in cinema properties and variable film content. Sites that are refurbished report attendance growth above traditional cinemas. Emerging markets, especially China, are seeing attendances increase and more cinemas opening. They have not seen the same growth in VoD, though this is changing quickly as smartphone adoption increases. However, they focus on traditional TV media. The argument that VoD will disrupt the cinema industry is that by providing greater on-demand content to consumers at home, demand for going-out will reduce, impacting cinema admissions. However, we believe cinema is a leisure activity, not just a channel to consume content. Analysis suggests cinema admissions benefit from VoD because the most regular cinemagoers stream the most content. Very few non-cinema-goers stream video content for long periods. Also, VoD is more focused on traditional television viewing rather than on cinema. In emerging countries especially, VoD focuses on shorter content, thus competing with TV. The major US companies offering VoD are seeing memberships rise, but while their content libraries are dominated by movies, films account for only 30 per cent of viewing time. Their TV content has increased sharply while movie content has decreased markedly. Studios are also looking to develop their VoD offerings, sometimes making prequels available there before new cinema releases. And VoD is showing signs of maturing in developed markets. As studios invest in film content and cinemas update their proposition, we expect admissions to grow. VoD is now leapfrogging into emerging markets as internet use grows and smartphones provide another channel to consume content away from TV viewing. People currently visit cinemas less often there than in developed countries, but without overcapacity problems, emerging nations can continue opening new theatres and increasing attendances. US overcapacity will remain structural, but admissions should shift to newer and refurbished properties, creating a tier of more attractive cinemas. The top US cinema operators have so far refurbished less than a quarter of the country’s total screen capacity but these premium format cinemas will capture the majority of admissions. Meanwhile emerging markets are bypassing older cinema technologies and introducing premium formats. Global box-office takings are set to grow in coming years with the Asia-Pacific expected to be the main contributor, thanks to strong growth in China and India. A collection of recently published insights from Ali Naqvi. The target price is based on the analyst’s assessment of the stock’s actual current value, although we expect it to take six to 12 months for the market price to reflect this. When the target price is more than 20% above the current share price, the stock will be classified as a Buy; when it is between 5% and 20% above the current share price, the stock may be classified as a Buy or a Hold; when it is between 5% below and 5% above the current share price, the stock will be classified as a Hold; when it is between 5% and 20% below the current share price, the stock may be classified as a Hold or a Reduce; and when it is more than 20% below the current share price, the stock will be classified as a Reduce. Our ratings are re-calibrated against these bands at the time of any 'material change' (initiation or resumption of coverage, change in target price or estimates). Upside/Downside is the percentage difference between the target price and the share price. 1 This report is dated as at 16 October 2018. 2 All market data included in this report are dated as at close 10 October 2018, unless a different date and/or a specific time of day is indicated in the report. 3 HSBC has procedures in place to identify and manage any potential conflicts of interest that arise in connection with its Research business. HSBC's analysts and its other staff who are involved in the preparation and dissemination of Research operate and have a management reporting line independent of HSBC's Investment Banking business. Information Barrier procedures are in place between the Investment Banking, Principal Trading, and Research businesses to ensure that any confidential and/or price sensitive information is handled in an appropriate manner. 4 You are not permitted to use, for reference, any data in this document for the purpose of (i) determining the interest payable, or other sums due, under loan agreements or under other financial contracts or instruments, (ii) determining the price at which a financial instrument may be bought or sold or traded or redeemed, or the value of a financial instrument, and/or (iii) measuring the performance of a financial instrument. 1. This report was produced and signed off by the author on 16 Oct 2018 14:25 GMT. In the UK this document has been issued and approved by HSBC Bank plc (“HSBC”) for the information of its Clients (as defined in the Rules of FCA) and those of its affiliates only. It is not intended for Retail Clients in the UK. If this research is received by a customer of an affiliate of HSBC, its provision to the recipient is subject to the terms of business in place between the recipient and such affiliate. HSBC Securities (USA) Inc. accepts responsibility for the content of this research report prepared by its non-US foreign affiliate. All U.S. persons receiving and/or accessing this report and wishing to effect transactions in any security discussed herein should do so with HSBC Securities (USA) Inc. in the United States and not with its non-US foreign affiliate, the issuer of this report. In Singapore, this publication is distributed by The Hongkong and Shanghai Banking Corporation Limited, Singapore Branch for the general information of institutional investors or other persons specified in Sections 274 and 304 of the Securities and Futures Act (Chapter 289) (“SFA”) and accredited investors and other persons in accordance with the conditions specified in Sections 275 and 305 of the SFA. This publication is not a prospectus as defined in the SFA. It may not be further distributed in whole or in part for any purpose. The Hongkong and Shanghai Banking Corporation Limited Singapore Branch is regulated by the Monetary Authority of Singapore. Recipients in Singapore should contact a "Hongkong and Shanghai Banking Corporation Limited, Singapore Branch" representative in respect of any matters arising from, or in connection with this report. In Canada, this document has been distributed by HSBC Securities (Canada) Inc. (member IIROC), and/or its affiliates. The information contained herein is under no circumstances to be construed as investment advice in any province or territory of Canada and is not tailored to the needs of the recipient. No securities commission or similar regulatory authority in Canada has reviewed or in any way passed judgment upon these materials, the information contained herein or the merits of the securities described herein, and any representation to the contrary is an offense. HSBC Bank plc is registered in England No 14259, is authorised by the Prudential Regulation Authority and regulated by the Financial Conduct Authority and the Prudential Regulation Authority and is a member of the London Stock Exchange. (070905) If you are an HSBC Private Banking (“PB”) customer with approval for receipt of relevant research publications by an applicable HSBC legal entity, you are eligible to receive this publication. To be eligible to receive such publications, you must have agreed to the applicable HSBC entity’s terms and conditions (“KRC Terms”) for access to the KRC, and the terms and conditions of any other internet banking service offered by that HSBC entity through which you will access research publications using the KRC. Distribution of this publication is the sole responsibility of the HSBC entity with whom you have agreed the KRC Terms. Low orbiting satellites can provide vital internet connections.